this warehouse racking configuration enables pallets to be stored two deep and accessible from a single aisle. The Double Deep XL pallet racking system from Link 51 is a deeper version of the XL Adjustable pallet racking. Using the same components, this warehouse racking configuration enables pallets to be stored two deep and accessible from a single aisle. Reducing the number of aisles in the warehouse frees up additional space, therefore increasing the pallet capacity of the warehouse. This Double Deep racking system provides a space saving storage solution by utilising the cubic storage space to its full potential. 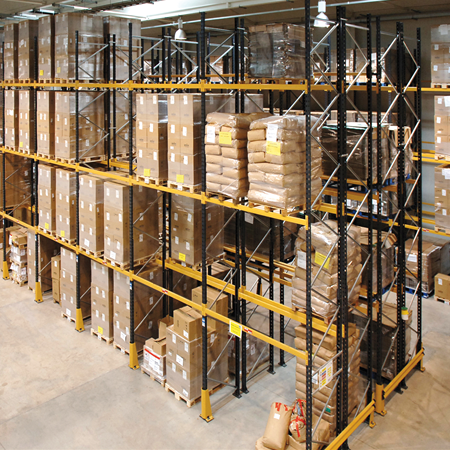 The Double Deep storage solution does restrict the speed of access to pallets, therefore it is crucial that an efficient stock management system is in place to maximise the benefits of the increased storage space.